Obviously, a relay with two poles can act like two gates (the input at the bottom has to be the same for both gates). You can also work out a buffer (swap the inputs of the NOT gate), or A OR NOT B and A AND NOT B. It is also possible to do things like “wired OR” with relays. For example, suppose you had ten AND gates made like the one above. If you want to OR the outputs together, you just connect the output wires. Any one (or more) AND gates triggering will drive the output high. Or, you could let ground be a 1 and float highs. This has the advantage of working better with ICs and other circuits that can sink more current than they can source. Then the relay coils are always hooked up to the positive supply and you need the ground to complete the circuit. There are other tricks you can use. 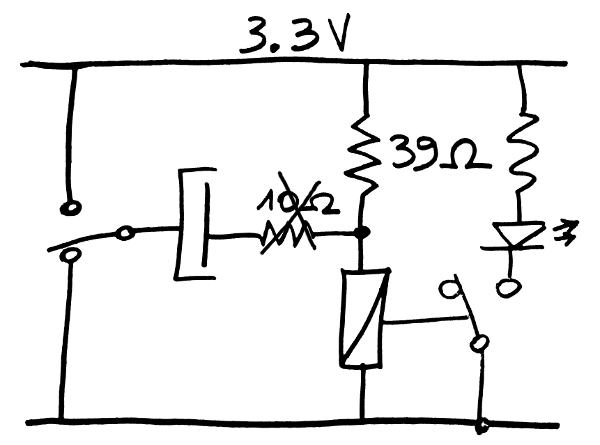 Diodes can handle some simple logic functions, although this may be considered cheating if you are trying to make a true relay computer. Resistors can convert normal relays into latching relays, as can extra contacts. If you do make both logic levels actual voltages, you can play tricks with feeding both sides of the coil. This makes a great XOR circuit–think about it. It is even more straightforward to create XOR if you don’t mind using two relays. Many modern demonstration relay computers bite the bullet and use semiconductors for memory and control circuits. This isn’t just in the realm of theory. Many relay computing devices were built in the last century. There are several modern examples, too, although they are mostly for show, not practical devices. There is a good looking 8-bit computer, for example, that only uses 83 relays. Watch it go in the attached video. In all fairness, though, it does use semiconductors for memory and the front panel. However, the architecture write up is quite illuminating, even if you don’t want to build the computer yourself. You can see a video of it in action below. [Paul] has a project over on Hackaday.io that refuses to use diodes for logic and has a whopping 32-bits of memory. To save relays, he uses a 1-bit ALU. There are quite a few others out there including [Simon Winder’s] impressive build to compute square roots with a telephone dial (see video below). We’ve covered some other cool relay builds in the past, including this 8-bit marvel that uses 152 relays and reads its programming from paper using optical sensing. There’s also this much larger computer that even has its own online simulator. If you’ve ever thought about building a computer with relays, this should give you plenty of inspiration. Just keep in mind that relays are deceptively simple: they are non-ideal devices made of coils and strips of spring steel. For example, arcing across contacts is bad, right? Depends. Some contact material depends on arcing to clean corrosion. Others just pit and fail. There’s a lot of subtlety to relays and a lot of their perceived unreliability is really just misapplication. Not that they are as reliable as modern semiconductor devices, of course, but well-made relays with the proper construction for their intended application can be pretty reliable. And a shoutout to [Yann Guidon], he has many relays. How many hackers does it take to change a bulb ? Wait a minute, we reinvent the bulb. A lot of PLCs out there although I imagine basic relays can be pretty noisy working. Next up mercury delay lines. PLCs have not been relay based in eons…. sure they are often programmed in “ladder logic” but there aren’t any actual relays involved in that. Many times it’s transistor outputs, but relays are used a lot too. There are things you need to run with more current, than the transistor outputs can provide, or different voltages etc. Outputs are not logic… so I’m not sure what you point is. PLCs long ago were based on relay logic but as I said that hasn’t been the case in forever. Seems like a more modern take would be to use analog SPDT switches such as SN74LVC1G3157 which is a single solid-state SPDT in a SOT-23-6 package. Cheaper than relays ($0.34 in single quantity), take less power to operate and are smaller than relays but large enough to be easily handled by the average person. As an electrical engineer, I deal with relay logic all the time at work. While most of the relays in my designs are used as electrically-actuated switches, the electrical isolation and fail-safe operation of electromechanical relays are necessary components for safety systems. I can’t risk a solid-state relay failing conductively and starting up equipment that’s supposed to be deenergized. I am am not sure where “most fpgas” came from. That should have been some. I will fix it in a bit. Actel’s A1020 was my first exposure to FPGA and MUX-based logic. There are obviously many solutions to this, but the above shows an example with the fewest muxes needed for each. So you can do anything with a single mux except NAND, NOR, XOR, and XNOR, which each need two. However, with CCPBRL, 2 relays are needed, one for inverting one input signal, the other for selecting the inverted or the non-inverted. In the mid 1980’s my dad owned a general store with a shoplifting problem. He installed cctv cameras but soon had more cameras than monitors. He designed and built a switcher controlled by telephone keypads operating relays switching video. He could control which one of ten cameras was being recorded on a VCR. He had six monitors; one showed the feed going to the VCR. The other five showed one of a pair of images. If he chose to record camera 1 then the monitor for cameras 1&2 would flip to show camera 2 because camera 1 was visible on the recording monitor. As a suspect customer moved around the store he could follow them, keeping them recorded, while keeping an eye on the rest of the store. The switcher used a bank of old telephone relays on a board, hard wired together and worked flawlessly for many years. I guess he just used the technology he was used to, having worked in the telephone industry after leaving university. Given that the electric relay was known by the mid 1800s (it was apparently invented independently by several people) and that Babbage had conceived the idea of a general-purpose computer around the same time, it is too bad that these ideas didn’t cross. Had Babbage considered a relay based design he might have gotten further if for no other reason than the mechanical tolerances are far lower with these components, and thus the costs would have been far lower. I have often thought that fluidic logic was within the capabilities of many ancient civilizations. The Egyptians, for example, could have built it using the flow of the Nile as power. Imagine Pharoh with a giant stone mainframe to do data processing. You have to wonder where computing would be today. The difference here being that for relay computing, both the concept and the hardware coexisted at the same time and in the same place. I should have also added that George Boole had written “The Laws of Thought” in the same period, so indeed all the necessary elements were at hand. The Egyptians, while decent mathematicians had not developed a comparable understanding of logic. As slow as the internet? I’ve worked on some elevator controls that were completely relay logic with approximately 200 relays. Also there are companies that sell elevators with the option of plc or relay logic the selling point of the relay logic being that it is cheaper to repair and maintain. When I was a kid one of the science museums had n exhibit that let you play tick tack toe against a computer that was made out of relays. It was very cool. I think one of the phone companies AT&T or Bell Labs) was behind it. The first-hand account given reports that they were telephone relays which, after a couple of weeks of being opened and shut once a second, wore out. I realise that this article is a couple of months old, but I want to mention some success. I’ve had in making my own relays (for use in computing circuits) with the help of a 3D printer. I think that one of the attractive things about relays is that the processes involved in manufacturing them need not be complex.